Parmesan Oven Roasted Tomatoes are one of our favorite summer dish dishes! 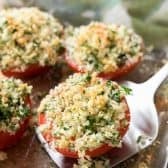 Ripe juicy garden tomatoes topped with a delicious garlicky parmesan crust and baked just until hot. Using a blender, food processor or Magic Bullet, process the bread into fresh breadcrumbs. (This took about 1 second in my Magic Bullet). In a small bowl, combine breadcrumbs, cheese, garlic, olive oil, herbs, salt and pepper. Toss until well mixed. Place sliced tomatoes in a shallow baking dish, season with salt & pepper. Top with breadcrumb mixture. Bake for 10-15 minutes or until crumbs are lightly browned. Be sure not to over bake so the tomatoes don’t become mushy.